Despite the increment in mobile revenues over the last few years, communications revenue growth is beginning to weaken as voice markets saturate. While the global digital resurgence has yielded some opportunity for telecom providers, voice revenues are declining continuously. How will the industry evolve over the next five years? 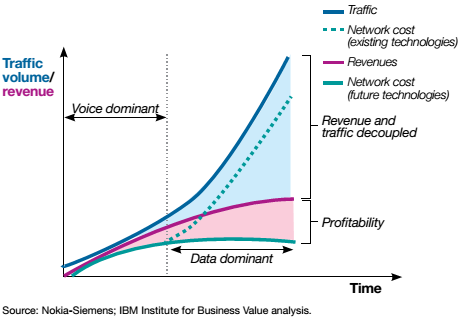 Will telecom operator strategies for voice services be proactive or protective? The telecommunications industry has experienced more change in the last decade than in its entire history. In 1999, only 15 percent of the world’s population had access to a telephone; by 2009, nearly 70 percent had mobile phones (Telco 2015, IBM). In addition to this phenomenal growth in mobile communications, the past decade also brought steep declines in public switched telephone network (PSTN) voice revenues, an explosion of over-the-top (OTT) communication services and global industry consolidation. 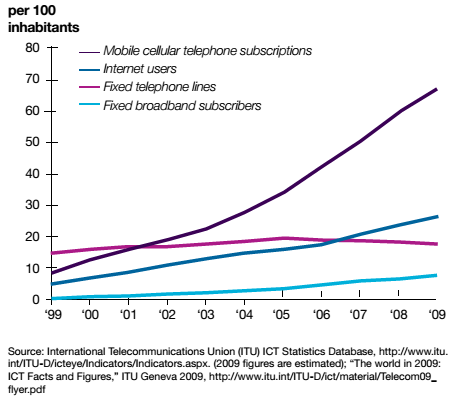 There is an accelerating technology shift to mobile broadband networks across the world. Mobile broadband connections (3G and 4G technologies) accounted for almost 50% of total connections at the end of 2015, and are set to increase to more than 70% by 2020. The factors driving this migration are greater availability and affordability of smartphones, more extensive and deeper network coverage, and in some cases operator handset subsidies (The Mobile Economy 2016, GSMA). Can telcos ride the wave? Despite the growth in number of subscribers and the network traffic, the profitability margins of telecom operators have started to shrink and continues to be so. According to the Spirit DSP report, the overall global telco voice revenues (including fixed subscriptions) will decline from $970.4 billion in 2012 to $799.6 billion by 2020, at a CAGR of 2.4%. Also, as a result of VoIP by 2020 the telecom industry worldwide will see a loss of revenues approximately worth $479billion which accounts for 6.9% of the total revenue from voice. “Consumer OTT VoIP Outlook: 2013 to 2018” by Ovum highlights that the OTT VoIP market is growing at a rate of 20 percent. Its application’s usage will reach 1.7 trillion minutes by 2018, which translates to $63 billion in lost revenue. According to this study, as a result of increasing demand of online applications for messaging, by the year 2016, telecom operators will stand to lose revenue worth $54 billion in messaging services. Who eats into telcos’ voice revenue? The main culprit of declining profitability of telcos is the OTT (Over-The-Top) service providers. They deliver audio, video and other media over the internet and bypass the traditional operator’s network. Since, the OTT players do not require any business or technology affiliations with network operators for providing such services, they are often known by the term “Over-The-Top” (OTT) applications. These lean and nimble OTT players, enabled by technology advances such as smartphones, super-fast IP networks, open source platforms, innovative services, cutting edge functionalities and shift in consumer preferences towards their “freemium” based business models are seeing an ever increasing adoption rate. Though they utilize the telco network and infrastructure, which requires continuous capital investment, they do not contribute directly to the telcos’ revenue. However OTT service usage require subscription of data pack thus driving the data revenue. But what is most worrying for the telcos is the fact that these OTT players offer services that are close substitute to their own offerings and are beginning to pose a credible and measurable threat to their revenues. 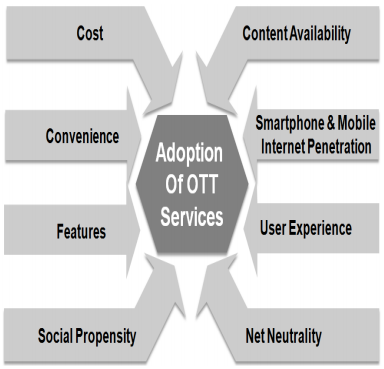 The wide variety of applications and services offered by OTT players is tempting the customers away from the telcos’ restricted, relatively more expensive and severely limited array of services. Although telecom operators are in a reactionary mode to the challenges introduced by OTT service providers, they are well-placed to confront them. Telecom operators can benefit not only from analyzing consumer trends but also through the factors that are leading to adoption of OTT services. It is very difficult for OTT players to provide customized content solutions for different countries as they operate in a global scale. In contrast, the telecom operators possess the advantage of customizability of services as they operate in local or regional scale. Telecom operators can offer localized content through IVR (Interactive Voice Response) based content delivery platforms where users can dial a short code and browse through voice menus to subscribe to different voice content services. This can be built as a content hosting platform where any content provider can host her voice content to make them available for mobile users. This allows the telecom operator to build a rich localized content platform which is unmatchable by OTT players. Deployments of Mylinex Content Delivery Platform in telecom operators generating additional revenue confirms that there is a significant demand for localized content. One of the main factors leading to the adoption of OTT services is the lower cost of making calls. To match that, telecom operators can offer subsidized calls for their users by the means of sponsored calls. It can be offered in couple of ways; either users can dial in a short code and win free airtime by involving in promotional activities of third party companies or the users can be given the option of listening to an advertisement in the beginning and continue the call free. According to the results of Mylinex Sponsored Call platform implementations in different telcos, it is evident that users are engaged in these activities as the call charges are subsidized or free of charge. Content bundling is another innovative way for the operator to bundle the data intensive OTTs like video apps (Netflix) with their normal voice subscription plans to encourage the customer for using these apps thus driving the increased data usage. This also enhances the customer experience as the time bound monthly limit, instead of per Mb charging, eliminates the fear factor for customers when signing up to a value added service. Operators can get into agreements with these OTT players and offer special data plans for their users which are tailor-made for that particular OTT service. Telecom operators in developing markets where there still is a considerable portion of feature phone users can offer OTT compatibility services for their users. For example, operators can offer regular voice call to VOIP call conversion solutions which enable feature phone users to make regular calls to OTT users at the other end. Telecom operators can charge for the regular call which is profitable than the amount of revenue they get from data calls. Another long term strategy which can be adopted by telecom operators would be to introduce its own OTT service. This will enable them to have full control over the service and also enable them to interact with other such initiatives within the telecom fraternity. Although it may not be the fastest route to market but it enables them to own the consumer relationship and expand into adjacent market and reach a much broader customer base. They can also leverage their core assets (control over the network, customer insight, customer care and distribution channel) to differentiate their OTT services from other offerings in the market. For example they can replicate the user’s regular profile into the OTT profile so that the user will have access to all the content, USSD or SMS based services she has subscribed even when she is roaming outside the country.